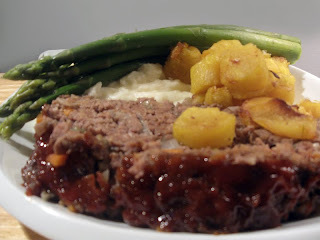 Meat Loaf has got to be one of the great comfort foods. It's also a great way to feed a big family, and on a budget. You don't have to spend a ton of money to make a great meal! Plus, it's great as leftovers. Eat it as is, or consider putting it in a sandwich? Mmm meat loaf sandwich. 1. In a frying pan, sautee chopped onion, sliced carrot, and sliced celery so that they are slightly cooked. Soak breadcrumbs in milk to ensure your meat loaf will be moist. 2. In a large bowl, combine ground beef, egg, bread crumbs, crushed garlic, a splash of worcestershire sauce, a squirt of ketchup, and the veggies from a pan. Mix with a fork or your hands and form into a big ball. 3. Put the big ball of meat into a casserole dish and form it into a loaf. 4. Mix ketchup, brown sugar, and white wine vinegar into a bowl to make a sauce for the top of the meat loaf. Brush or pour on top of the meat loaf. 5. Put the meat loaf in the oven at 400 F degrees for about 1 hour, or 1 hour and 15 minutes. Serve with mashed potatoes and your favourite vegetable.